New York, NY—January 30, 2019—Robots that are self-aware have been science fiction fodder for decades, and now we may finally be getting closer. Humans are unique in being able to imagine themselves—to picture themselves in future scenarios, such as walking along the beach on a warm sunny day. Humans can also learn by revisiting past experiences and reflecting on what went right or wrong. While humans and animals acquire and adapt their self-image over their lifetime, most robots still learn using human-provided simulators and models, or by laborious, time-consuming trial and error. Robots have not learned to simulate themselves the way humans do. Video of Columbia Engineering robot that learns what it is, with zero prior knowledge of physics, geometry, or motor dynamics. Initially the robot has no clue what its shape is. After a brief period of “babbling,” and within about a day of intensive computing, the robot creates a self-simulation, which it can then use to contemplate and adapt to different situations, handling new tasks as well as detecting and repairing damage in its body. Even in an open-loop system, which involves performing a task based entirely on the internal self-model, without any external feedback, the robot was able to complete the pick-and-place task with a 44 percent success rate. “That's like trying to pick up a glass of water with your eyes closed, a process difficult even for humans,” observed the study’s lead author Kwiatkowski, a PhD student in the computer science department who works in Lipson’s lab. 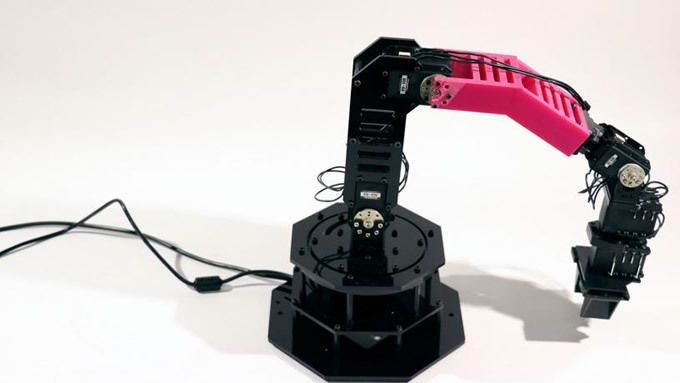 An image of the deformed robotic arm, deformed by using a 3d printed piece as a replacement for one of the standard arm parts to extend and change the angle of the gripper. The self-modeling robot was also used for other tasks, such as writing text using a marker. To test whether the self-model could detect damage to itself, the researchers 3D-printed a deformed part to simulate damage and the robot was able to detect the change and re-train its self-model. The new self-model enabled the robot to resume its pick-and-place tasks with little loss of performance. The researchers are now exploring whether robots can model not just their own bodies, but also their own minds, i.e. whether robots can think about thinking.